Comments: I swear by this battery to power monitors, laptops, and even lights while on the road. This will allow you to charge batteries and edit in your car/van for what seems like an eternity on your laptop. 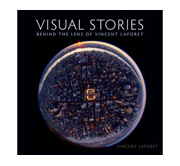 For more information you can read a review here. This is a must have accessory for every road warrior out there. Description (from Anton Bauer): • Freedom-1 Power Solution is available in 110V/60Hz AC or 230V/50Hz AC. The 110V AC model comes with the standard USA grounded plug. The 230V AC model comes with both the UK and Euro power cords. The Freedom-1 Power Solution’s electronics-friendly technology delivers precise pure sine wave AC power, just like AC provided in studio environments. Comments: Powers not only the Canon cameras but a huge variety of accessories and monitors support this battery and have adapter for it. 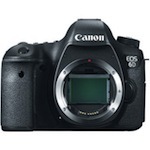 Description (from B&H): • The Canon LP-E6 Rechargeable Lithium-ion Battery Pack (7.2V), has a capacity of 1800mAh, making it possible to shoot up to 850 shots at normal temperatures on a single battery charge. 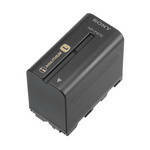 The battery is also more compact and lightweight than previous battery models. The LP-E6 battery also communicates with the EOS 5D Mark II, 5D Mark III, 60D, 70D, 6D and 7D digital cameras, so that you can always check the remaining capacity on the camera’s power source info screen. 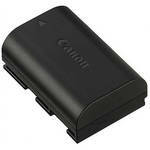 Description (from B&H): The LP-E4N Battery Pack from Canon is a rechargeable lithium-ion battery that is compatible with Select Canon cameras. The Battery Pack also communicates with these cameras so that you can check the remaining charge, shutter count, and recharge performance in the camera’s power source info screen. Compatible with EOS-1D Mark III, 1D Mark IV, 1D X, 1Ds Mark III, 1D C.
Comments: The BlueShape BV090 Granite V-Mount Battery Kit is our newest V-mount solution! The battery replaces bulky battery systems of the past by giving you a 14.8V 90Wh Lithium-Ion Battery with the same capacity of our older Anton Bauer Dionic 90 but smaller! The V-mount on the back hooks directly onto many systems or our BlueShape Gold Mount adapter plates. Each battery has 2 P-Tap connections (one on each side) for devices operating at 14.8V nominal voltage. An external battery gauge gives you LED increments to show remaining power. Our kit includes one Granite BV090 90Wh battery and one CVTR1M portable charger. Charging takes about 2.5 hours per battery. 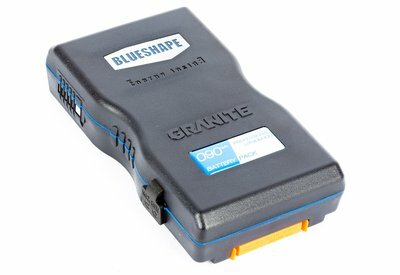 Description: The BlueShape BV090 Granite V-Mount Battery Kit is our newest V-mount solution! The battery replaces bulky battery systems of the past by giving you a 14.8V 90Wh Lithium-Ion Battery with the same capacity of our older Anton Bauer Dionic 90 but smaller! The V-mount on the back hooks directly onto many systems or our BlueShape Gold Mount adapter plates. Each battery has 2 P-Tap connections (one on each side) for devices operating at 14.8V nominal voltage. An external battery gauge gives you LED increments to show remaining power. Our kit includes one Granite BV090 90Wh battery and one CVTR1M portable charger. Charging takes about 2.5 hours per battery. Comments: While many of you will initially start with basic handheld systems and the Zacuto Z-Finder to keep things simple (and rightfully so!) as you move into full day narrative or documentary shoots – you’ll find that you’ll need professional grade batteries to power your cameras, external monitors, motors, converter boxes etc etc. Anton Bauer is the industry standard battery in the video and film world. 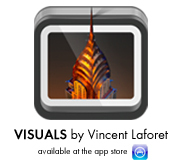 Their products are incredibly reliable – and precise. You will find that you can very easily read out the amount of juice you have left at anytime – and also the batteries will give you a read-out of how much time you have left at the current power draw which is incredibly useful. Ergo if it’s late in the day and you’re low on juice – you can turn off one of your two onboard monitors to get some extra time before you empty the battery. The Anton Bauer batteries will power your cameras (with the powerPack and backPack in the Accessories page) your Marshall Monitors, LED Lights, AxisOne or other motors, Steadicam units, and pretty much anything on set. 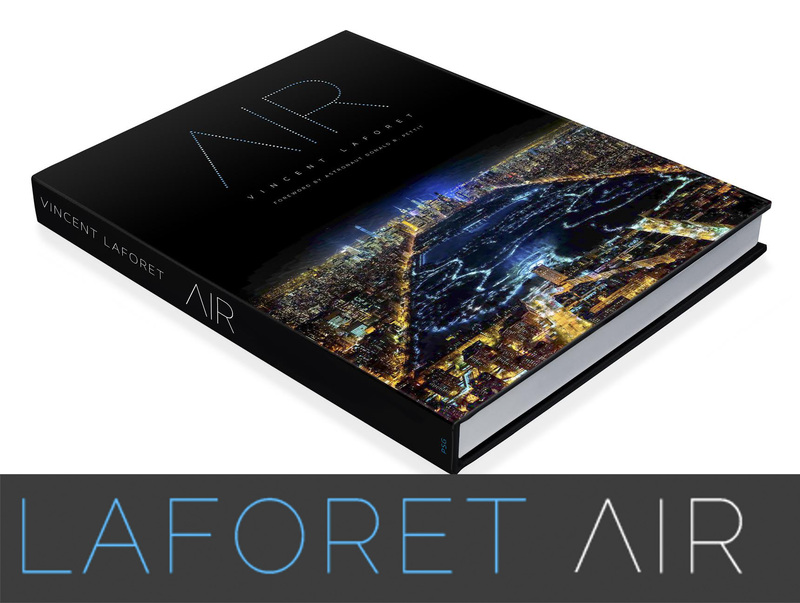 Therefore this is a longterm investment you can make without much reservation. Description (from Anton Bauer): The DIONIC HC is capable of delivering up to 10 amps for high current draw applications, including on-camera lighting. The 91 watt-hour DIONIC HC can operate a 40 Watt HD camera for over 2 hours. Comments: Basically this is the same battery as above – just a little lighter duty. Both batteries are 14.4 volt and approx. 6.25 Amps, (the 90 is a 90Wh battery and the HC 91) but the difference between these two batteries are the cells. HC’s are made with special Li-Ion Mixed Metal cells to handle high current draws of 10Amp constant and 18 Amp spike. (Also the special honey comb cell design and cell configuration offer a great protection aspect to isolate cells in the unlikely event of failure.) Using HC battery will give you longer battery life for your high current draw applications. Using HCX will give you the same, but longer run-times as well (124 Wh). Description (from Anton Bauer): The DIONIC 90 can handle a 6 amp load and is the ideal battery choice when low weight and longer run-times are a priority. Comments: Even more power than the units above without too much more added weight. 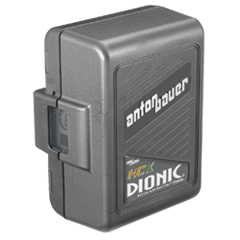 The Description (from Anton Bauer): DIONIC® HCX is the latest addition to our high current product line. With a 124 watt-hour capacity and the ability to sustain a 10 amp draw, the DIONIC HCX will run a 40 watt camera with a 20 watt light for 2 hours. The motion detection feature incorporates a “deep sleep” setting that reduces battery self-discharge, allowing for extended periods of storage with minimal capacity loss. The battery may be “awakened” by the built in motion sensor. To provide precise run-time data, an enhanced RealTime® LCD fuel gauge has been incorporated to display up to nine hours of run-time (under low power load conditions) using a seven-segment display enclosed by four circular arcs that indicate 15-minute time intervals. Comments: This is the big daddy… When you need to go for hours on end without the possibility of swapping batteries. 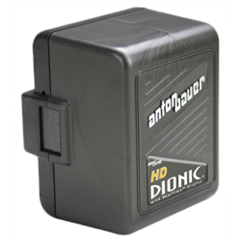 Description (from Anton Bauer): • Delivering up to 10 amps of power, the DIONIC® HD Logic Series® Battery features Special Application Li-Ion cell technology. The DIONIC HD incorporates our latest software architecture and improved LCD for superior safety and reliability. Weighing 40% less than a NiCad or NiMH battery, it has 25% more capacity and will run a 30 Watt camera for over six hours. 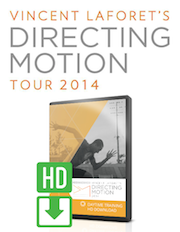 The DIONIC HD is a great solution for digital cinema cameras such as the, Sony F65, RED cameras, ARRI Alexa, Vision Research Phantom series and more. Comments: Incredibly common battery type that will power most monitors and accessories – a "standard’ battery you should have as part of your kit given how many accessories use them. Description (from B&H): Small and lightweight, Sony’s NP-F970 Info-Lithium Battery Pack (6300mAh) provides the advantages of lithium-ion, meaning it can be charged or discharged at anytime without developing memory effect. This means the battery never loses its ability to hold a full charge. The NP-F970 displays remaining battery time on the LCD as well as in the viewfinder by continuously communicating with the camcorder. The battery lasts for up to 12 hours on a single full charge. Sony’s Info-Lithium battery packs have a built-in micro processor that accurately calculates remaining battery life in minutes. 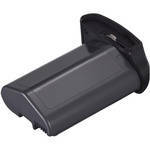 Comments: Perfect for those time lapses that go for days on end – this battery will last you days. Description (from Switronix): The PowerBase 70 Battery Pack from Switronix contains a 70 Wh, 14.8V Lithium-ion battery designed to extend HD movie recording time for the Canon EOS 5D Mark II and 7D digital cameras. The PowerBase 70 delivers six times more power than the original battery supplied with the camera. It is also intended to streamline your High Definition (HD) movie recording: the PowerBase 70 mounts under the camera and doubles as a grip or can be attached to an HDSLR support via its 1/4"-20 release plate or V-Mt mount. Wired as a 14.8v battery pack, it can provide extended power for up to two additional 12VDC devices such as lights, monitors or HD converters as well as other devices requiring lower voltage (an optional XP power regulation cable is needed). The pack is also furnished with 1/4"-20 threads on either side to mount accessories. Comments: This is a heavy duty battery that we use to power numerous systems when a regular Dionic battery can’t handle the energy needed. I have used this extensively on sets to power camera systems on dollies, and taken it in helicopters with me to power our gyro stabilization system. 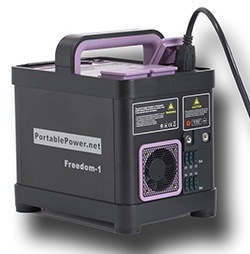 Most recently, we used it to power our entire wireless VTR setup in the desert on the set of "Mobius." Description (from Anton Bauer): The Anton Bauer CINE VCLX Battery is a 14.4v and 28v 560Wh NiMH battery that provides dual simultaneous outputs and is ideal for high current applications. Power output is via two 4-pin XLR connectors for 14.4v and one 3-pin XLR connector for 14.4v. Hi.,A power source for a portable device.